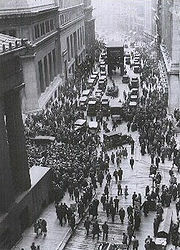 The great depression started in 1929 with the famous stock market crash. This had such a severe impact on consumers that their spending decreased significantly. This in turn caused companies to cut back production, leading to unemployment. This started the downward vicious circle. During the great depression many banks went into bankruptcy. It is the classical example of massive bank runs in a country. There are several theories on the origin and development of the great depression. Many of these involve the availability of money (the money supply). During the period preceding the 1929 crash an ample amount of money was available. Banks had been lending out a lot of money and the country could be considered over-indebted. The money supply was relatively large. A lot of this money was invested into the stock market. When this crashed, many of the loans could not be repaid. As a result many banks went bankrupt (and the bank runs started). This caused a downward spiral in the monetary sense. The money supply contracted as loans were repaid, or businesses and banks went broke. Investors were unwilling to invest due to poor expected profits. Thus reducing the money supply even further. This was aggravated by deflation, which increased the pressure of the remaining debt. As the availability of money decreased and existing debt became more of a burden, consumption and investments plummeted. Only with the election of Franklin D. Roosevelt (1932) and his New Deal did the end of the great depression come into view.